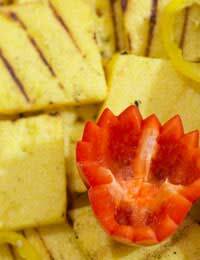 Polenta has been a staple of the rural northern Italian diet for hundreds or years. What could be a simpler source of nutrition than yellow cornmeal ground from the maize crops that grows in such abundance?In the past decade it has enjoyed its culinary 15 minutes of fame, appearing on the menus of some of the smarter restaurants of northern Europe but at heart it remains a robust alternative to potatoes when twinned with meat or fish, or on its own with the addition of a few extra layers of flavour. Like pasta and rice, polenta does not make too many demands on kitchen utensils while a single large stockpot is all you are going to need to bring it to fruition. 1.75 litres of water brought to a rolling boil in the aforementioned stockpot. Weigh out around 250 grams of the yellow cornmeal and begin adding it in a steady stream to the water with one hand while stirring continuously with a long wooden spoon. When all the cornmeal has been swallowed up by the liquid, turn down the heat on the stove so that the mixture begins to slowly simmer. What you want to avoid at all costs is the mixture beginning to spit, particularly as it thickens - being the unfortunate subject of a direct hit can be quite a stinging experience. Periodically give the mixture a stir in order to avoid it sticking to the bottom of the pot and burning - this will taint the taste of the finished polenta. One easy way to check that the cooking process is finished is to give it a good stir with the wooden spoon. If it comes clear of the sides of the pot then the marriage of corn meal and water is complete. At any stage of the process, a measure of salt can be added. However the salt has no direct influence on what is happening in the pot and is only used as a means of seasoning, so those concerned about levels of sodium in their diet can simply leave it out. Processing the finished polenta very much depends on what you plan to do with it. Those who do not wish to stand on ceremony could simply issue it in large dollops on to the plates of the expectant diners. Presenting the polenta in strips, a popular method in restaurants requires simply pouring the piping hot mixture on to a metal tray brushed with a little extra virgin olive oil. Leave it to cool, and then cut into strips and heat up on a griddle pan to achieve those caramelised tiger stripes so beloved by presentation-conscious chefs. Alternatively, pour the polenta into a glass bowl, leave to cool, scoop out the middle with a large serving spoon and fill with a vegetable-based or meat sauce and reheat in the oven or microwave.